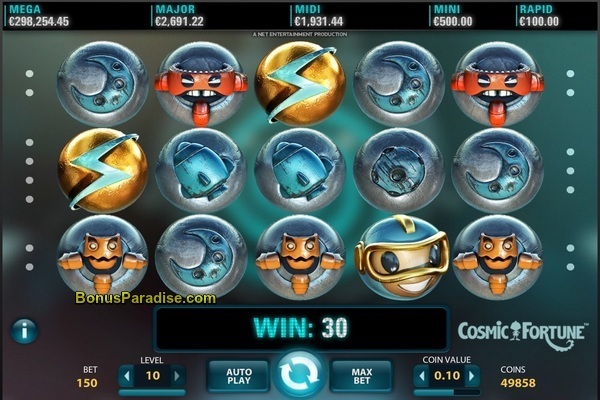 Discussion in 'Online Games - News and Reviews' started by Marina, Dec 20, 2014.
the slot presents “an action-packed space journey that leaves players wanting more.” Launched in November 2014, Cosmic Fortune is the first NetEnt slot with five jackpots. of this slot are Avalanche Feature and Free Falls. which icons from above fall into the spaces created, creating opportunities for more winning combinations and more prizes. However, scatter combinations are counted only once in the Avalanche Feature. If players land at least three scatter icons in the base game, they will get 10 Free Falls. They will get 5 Free Falls for every extra scatter in the combination. This feature converts all the icons in winning combinationsinto marbles and the number of marbles collected is displayed on the gaming screen. If players succeed in getting marbles, the Free Falls Bonus Game gets activated at the end of the Free Falls feature. During the bonus game, all the marbles that players have won randomly fall down into the three Coin Win Cups and one Bonus Collector Cup at the bottom of the reels. the chance to win one of the five jackpots that this delightful slot offers. marbles falling into the coin win cups offer coins. I really like the Cosmic Fortune Slot. I always hope to get the second bonus round and hope to win one of the 5 jackpots! Mike I cross my fingers for you. If you not win a jackpot than it is sure that I never win one. I really like this new Slot! They are getting uniquer and uniquer!